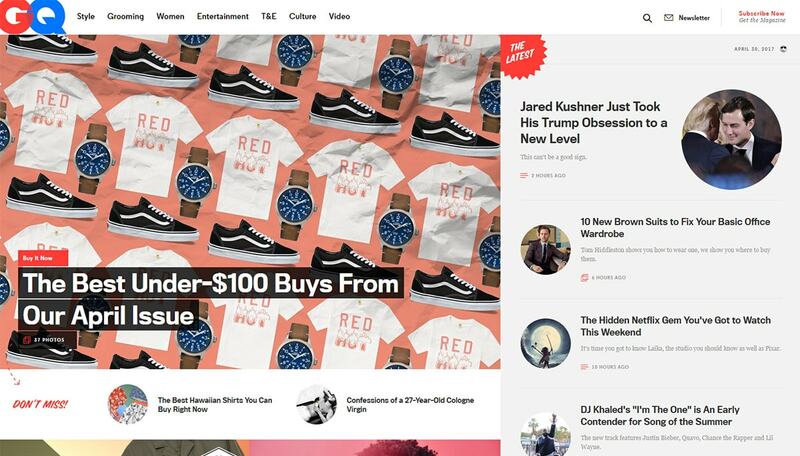 The design world is abuzz with the rise of online magazines. But the vast majority of these sites run on blogging platforms like WordPress, and they operate almost exactly like traditional weblogs. So where does someone draw the line between a traditional blog and an online magazine? And if you’re thinking of launching a new blog/magazine how do you differentiate yourself? Let’s delve into this subject from a designer’s perspective. The growth of online magazines means that more publications are going digital with plenty of opportunity for newcomers to get into the action. Digital publications have such a wide audience that it almost makes more sense to go digital over print. Most people have digital e-readers and in this past year mobile use surpassed desktop for the first time ever. But what makes an online publication seem more “authoritative” like a magazine? What differentiates between general blogs and online magazines like Time, Inc, and Forbes? It seems like many factors are involved but this concept of “authority” is definitely a big one, both in design and content. 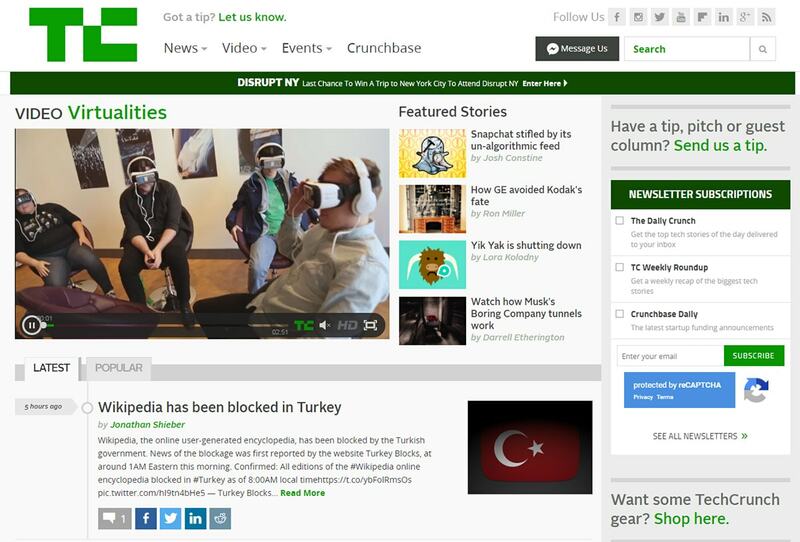 For example the TechCrunch wiki entry doesn’t describe the site as a blog at all. Yet if you go back far enough you’ll see it was called a blog when it first started. The same can be said for Mashable which is now a huge online media publisher. I consider these ideas to be generally true, yet all 3 of these rules can be broken. A blog could certainly hire writers, and blogs can have massive audiences and make good money. The creator of the Modest Man blog grew his audience and advertising base to reach $10k/mo and it still feels like a blog. Not to mention Pinch of Yum calls itself a food blog, yet based on their income reports the blog is really a fulltime business. This is the real crux of the discussion. I’d argue the real difference is in branding, style, and presentation. This can all be explained better using examples so let’s take a look at this blog/magazine divide to see where the line is. 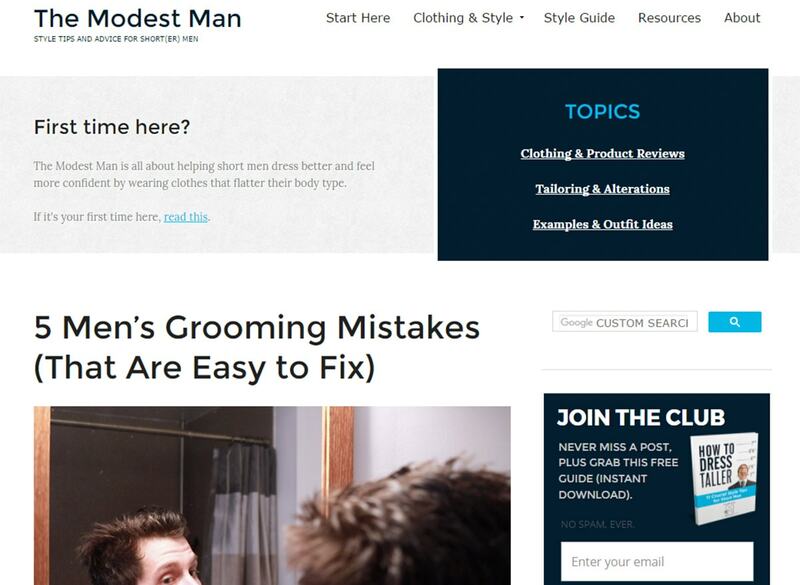 If you want to be considered an online magazine then you’ll want a magazine theme. This is a crucial aspect of running a site because looks do matter. Visitors judge your website in the blink of an eye, usually between 2-4 seconds. Your design should immediately let visitors know that you’re an authority on whatever subject you cover. If you already have some authority then you can get by with simple designs like Craigslist. But with millions of blogs already online you’re competing against an army of sites, many using very poor designs. If yours blends into the crowd then you stand no chance of ever breaking outside the label of a “generic blog”. 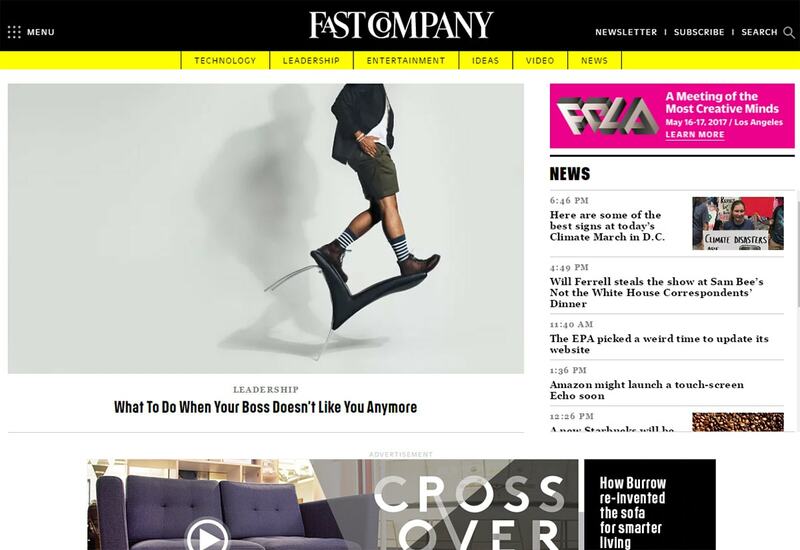 Take a look at Fast Company’s homepage and look at the diverse content styles. Many different thumbnails, headers, and column structures all work together creating a unique magazine look. Following this pattern on your homepage is a good first step to appear more like a magazine. Even if you only update once or twice a month it’s better to look authoritative right away. To move beyond a simple blog you need to offer more than what most blogs offer. You need to create a brand around your website and publish more than just articles. Look at the incredible rise of Smashing Magazine. Many would still call them “just a blog”. But if you dig deeper you’ll notice it’s really a massive media company. They publish their own books and host their own conference. Smashing Magazine isn’t just a digital blog anymore. It’s a complete authoritative brand in the web design/dev space. You certainly don’t need to push your blog this hard by launching a conference every year under your brand. There are much smaller projects you can tackle to build your site’s credibility. The first point on that list may seem crazy. 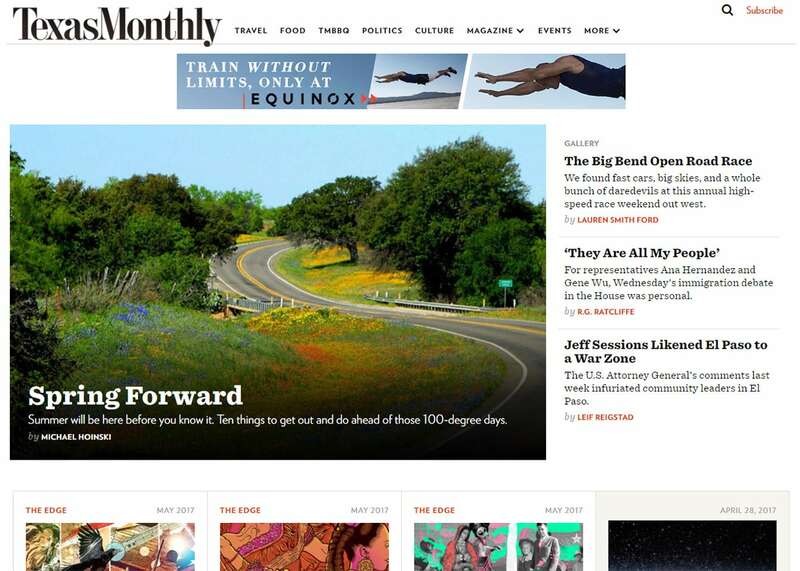 But it actually works well for the site Texas Monthly. Notice that site is basically a blog, yet it gives the impression of being a newspaper/magazine. Looks matter! They have an entire magazine archive where you can browse and subscribe to all their issues. This is one strategy that requires a lot of effort, but it also incentivizes readers to sign up to your site and ideally pay for the value. This lets you create a true magazine presence while also monetizing your content. The toughest part is actually getting people to subscribe. But that’s just part of online publishing! If you want to push beyond blogging try to find ways to expand outside your writing. There’s usually a clear divide between the content you find on a blog and what you find on magazine sites. Think about the type of content you’re publishing. Is it all personal opinions, quick posts, random thoughts or colloquial reviews? That’s usually the type of content you find on a blog. And that’s totally fine! For example Malan Darras runs a personal blog covering his work in marketing, music, and just general life. It’s an awesome blog and it never needs to be anything more than that. Understand your content goals and clarify these early on. A large magazine-style content site is not for everyone. It usually requires some level of journalistic integrity and a clear goal with content. Magazines lean towards journalistic content because this is where they originally come from. Industry news in trade magazines, op-ed pieces, interviews, how-tos and a mix of related content all come together to form an entertaining magazine. But remember that longform content isn’t always the right goal either. Sometimes you just need to follow whatever you want to publish, even if it seems ridiculous. 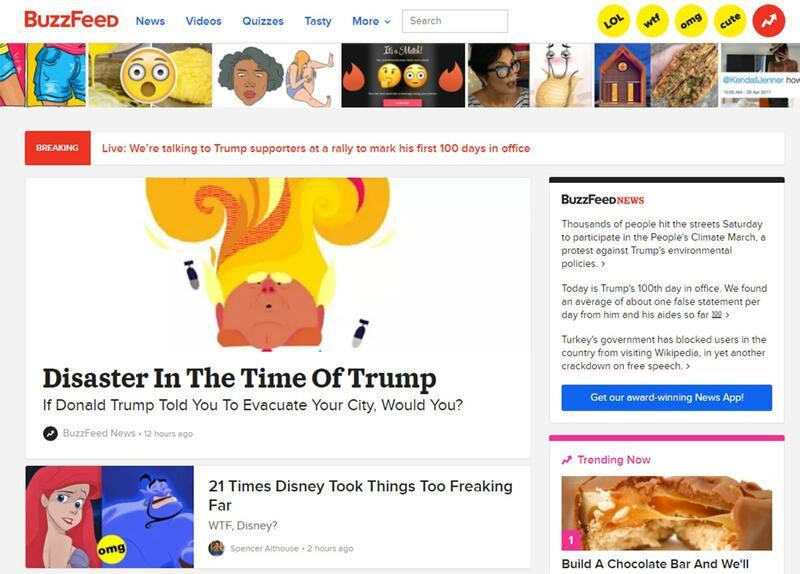 Few people look to BuzzFeed for authoritative news but the site still earns well and it uses virality to its advantage. One other point to mention is authorship. Since blogs are typically a solo effort you won’t always find multiple authors or custom author bios. However magazines typically hire writers or bring on guest writers, so adding bios to your posts can give this impression. An author bio doesn’t guarantee much authority. But it definitely helps! If you can appear to be a larger site to most visitors then you’ll leave a lasting impression that goes beyond simple blogging. Tons of people launch blogs just for fun and maybe a little extra cash on the side. But nobody launches a magazine for fun. Publishing is a business, and if you plan to launch one you have to treat it as such. This isn’t something the user will see on your homepage directly. It’s subtle. It’s the way you brand your site, your content guidelines, your newsletter layouts. Online magazines operate like for-profit businesses with KPIs and clear goals. If you can run your blog like a business then it might scale large enough to actually become one. Remember that the goal of both blogs & magazines is to publish great content and share it with the world. The labels “blog” and “magazine” are still new to websites, and online magazines were basically non existent 10 years ago. But there is most certainly a difference between blogs & online magazines. The line just isn’t very clear and it’s something we’ll discover more as time goes on. I do hope this article clarifies some key points that can help anyone turn a blog from a simple WordPress site into an authoritative and trustworthy magazine brand. And if you have any other ideas or suggestions drop a line in the comments area below.